Early on my mother instilled in me the importance of writing thank you cards. While some kids begged and pleaded and did whatever they could to get out of writing to them, I was always eager to sit down right away and write them. Perhaps it was because of my love for writing letters. Whatever it was, I can only hope my daughter may enjoy it too--as much of a chore as it may seem at times for a child. This year I decided it was her turn to start writing her own thank you cards. With my help of course. She learned to write her letters the year before last, but this past school year they began to make more sense to her. She understands that they make up words. 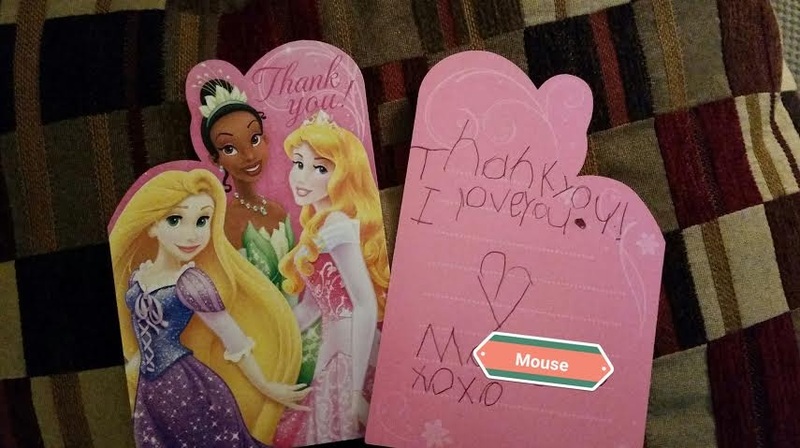 Mouse was more than eager to attempt to write her own thank you cards after her birthday this past March. 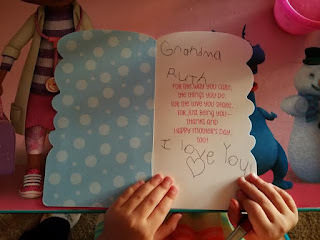 She likes to sign her name to all cards nowadays and include her own little note. She has even drawing pictures, asking for envelopes and telling me who I should send them to. 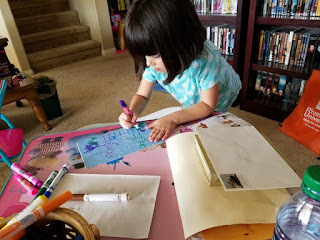 Letter writing was a hobby of mine for many years, and I am happy to see my daughter take an interest in it too. Do you send out thank you cards? Do you enjoy letter writing? I do send out thank you cards and taught my son to as well. I wrote mine right away, like you, but I always had to nag him to do his. Getting a note from a sweet little one like Mouse is always a treat! Yay, Mouse! Beautiful work! Well, you know I love both sending and receiving letters. :) Here is a link to a letter from one of my favorite actors, written when he was 17. He will always be a star in my firmament. I'm not good at sending out thank you cards and I feel so guilty about it! I love that you're having Mouse do her own! I'm sure her grandmother loved her card! I have the Tornado sign cards sometimes but it's definitely an area I need to improve on. Mouse's works are lovely! It's great that children loves writing in any form. I love writing myself too. My eldest is trying to write more now as she sometimes jots down her thoughts on a journal. I'm trying to guide my youngest in her composition though as her sentence construction is still a bit weak. Melody - I know it can be a chore for her when I make her sit and write out her thank you's, but usually letting her draw a picture to go with it, is enough to make it worth her while. :-) I think it's wonderful your eldest is starting to journal. I wish I had stuck with it. I love writing and receiving letters. It's sad that hardly anyone sends real letters any more. Email and texts are fast and convenient, but there's something about holding and opening a real letter...nothing beats that. Lark - I used to be much better at letter writing than I am now. I do enjoy it though. Yes, e-mail and texts are very fast and convenient, but they don't hold the same magic that a paper letter does. I was going through my grandmother's scrapbook of my grandfather's time during the war and she saved his letters and telegrams. It was so neat to be able to read through them. How cute! I've always loved writing and getting letters. I used to have penpals through a riding program I was in, so it was with other horse crazy girls. Where's that darn heart emoji when I need it?! Well done, mom! So sweet, and great idea to write her own. I think there was a time I did; must admit I now just say thank you or send a text/email. Charlie - I have some very old school relatives who are adamant about the format they receive thank you's in. I can't tell you the number of times I have heard, "I will not send another gift if I don't get a proper thank you card!" I imagine e-mails and texts are more commonplace nowadays. So glad to see Mouse is enjoying putting her cards together. I bet that is something her grandma is going to treasure! I definitely enjoyed writing letters and really do miss it. Isn't it the best to get a letter in the mail. Iliana - My plan is to one day make a hobby out of making cards with Mouse. I think it'd be fun. I just need to buy some supplies and make the time to do it. I think it's something we'd both enjoy doing together. There is something so special about receiving that first card signed by the little people in your life. Its wonderful to read that Mouse gets such pleasure in writing.